The Wish Fish Family is a crudely animated ten-minute cartoon that relentlessly pokes fun at topics no other series would dare. Bigotry, sexism and domestic violence are just an everyday occurrence for this family of fish in a series that gives social commentary on the all-too-real dark side of humanity. Harold is just your average, racist, abusive, controlling fish father with a cliché stay-at-home housewife, homosexual teenage son and intruding duck neighbor. Chaos and family feuds are never far behind these mismatched characters in a not-so-traditional sitcom that explores what life is really like for many families in America. 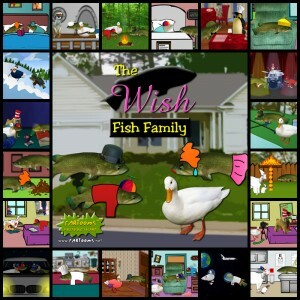 So c’mon and join The Wish Fish Family in the web toon that will have you wishing for more!